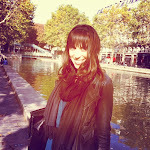 LaFleur de Paris: I can't stop Bragging ! I’ll admit that I was skeptical at first – their olive oil isn’t in a fancy container like most of the "top" olive oils I find in Paris and elsewhere and their packaging looks like it’s out of a 1940s magazine ad (but a very cool, vintage 1940s magazine ad at that). And then, I tasted the products. Oh là là! Not only are all of their products extremely healthy, but they actually TASTE great. Their extra virgin olive oil has found its way into pretty much every meal I’ve made this summer and their nutritional yeast is packed with cheesy flavor and nutritional benefits to boot. 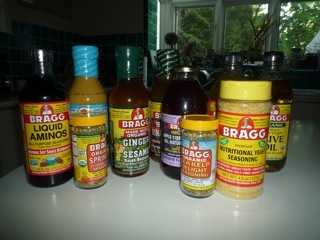 The olive oil and apple cider vinegars make for an easy vinaigrette on their own, or try Bragg's own salad dressing creations with creative combos like ginger and sesame, Hawaiian or "Braggberry." The liquid aminos give traditional soy sauce a run for its money and are unique on the health market. The liquid aminos are at every Canyon Ranch spa on the salad bar and I’ve noticed have become an indispensable part of healthy recipes for bloggers and cookbook authors all over North America. Patricia Bragg is a nutritionist and author known for her how-to books helping people to adopt her “Bragg Healthy Lifestyle” and philosophy. She’s worked with some top talents like Clint Eastwood, The Beach Boys, Jack Lalanne, Metropolitan Opera stars and even Olympic athletes. (But who’s Bragging?) I’m such a fan! (Of the Bragg product line, that is, though I’ll admit to the occasional rendition of “Surfin’ USA” in the shower.) Bragg makes a great apple cider vinegar and even some creative apple cider vinegar-based beverages for your own at-home drinkable detox. And table salt was SO last season – Bragg’s organic sprinkle seasoning is the new way to dress (your salads and meals, that is, not yourself – I don’t recommend dousing yourself in a garlic, ginger, onion and other herb mixture, you may not be very popular). The salt-free flavorful herb combo adds sodium-free savor to any dish.